Fifteen Joyceans have contributed significant essays and original documents concerning Joyce, his times, and his career. Never before published, these pieces which deal with all of Joyce’s works display new insights into Joyce’s life and work, present new discoveries, and give suggestions for the direction which Joyce scholarship will take. 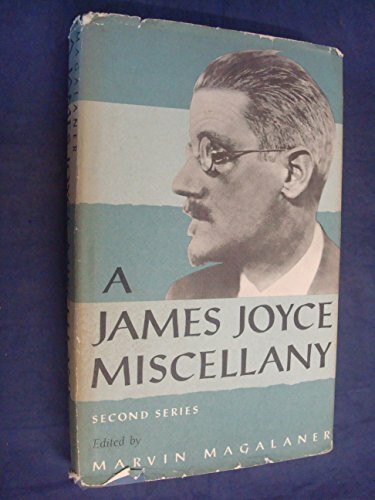 The contents of the Miscel­lany are important in themselves as separate pieces, but they are equally significant, taken together as a whole, for the picture they give of the state of contemporary Joyce studies. Each essay presents a new facet of the curious individual that was Joyce, and all the essays collectively give the reader a better opportunity to see the whole Joyce than ever before possible. Because of the wide variety of subjects discussed in the essays, the book is of interest to everyone who enjoys reading and discussing twentieth-century literature. Marvin Magalaner is Assistant Professor of English at the City College of New York and editor for The James Joyce Society. He is the author of Joyce: The Man, The Work, The Reputation.